With a single runway handling 10.5 million passengers annually, John Wayne Airport (SNA) relies on safe nighttime operations to maintain its carefully orchestrated traffic schedule. Located in bustling Orange County, California, SNA is subject to community-imposed noise restrictions that limit commercial traffic to no more than 10.8 million passengers per year through the end of 2020. In addition, its control tower operates from 6:15 a.m. to 11:15 p.m,, and the allowable overnight noise level is capped at 86 decibels. As a result, the county-owned airport conducts almost all of its airfield pavement maintenance at night, when only low-noise general aviation aircraft are allowed to operate. “Other airports don’t have to do maintenance work at night, but we don’t have other options,” explains Maintenance Supervisor Martin Ness. Every four months, an outside contractor comes in to remove rubber buildup from 125,000 square feet of the 5,700-foot runway. The runway is closed to all traffic for three nights while a lone equipment operator works from 11:15 p.m. to 5:30 a.m.
“We scope the runway and take friction readings to determine what areas need the most work,” notes Ness. The contractor, Nevada-based Surface Prep and Maintenance, uses a single rig equipped with high-pressure water sprayers and two cyclonic brush heads. Built-in vacuums collect the water and small rubber pieces it loosens. The debris is separated out for recycling, and the water, once tested as safe, is released into the sanitary sewer. SNA maintenance crews then repaint the clean centerlines over the course of two to three nights. All of the airfield’s white lines are repainted once a year—and the work always occurs at night, notes Ness. 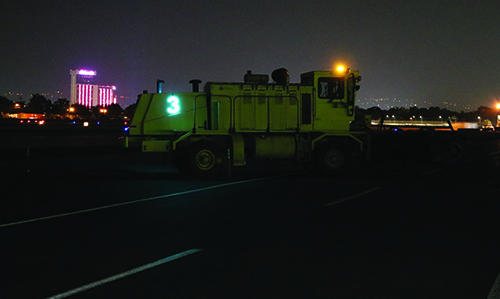 In 2015, SNA took an additional step to improve safety for Operations staff driving on its dark runway by increasing the visibility of on-field operations vehicles with illuminated identification numbers. The new vehicle markings use electroluminescent technology to light up, and are designed to be seen from 700 to 1,000 feet away. It costs the airport about $1,000 to equip each car with the new illuminated numbers. SNA and AirEL initially tested the illuminated numbers on the side of an aircraft rescue and firefighting (ARFF) truck. When the vehicle reached the end of the runway and turned back toward the tower, the illuminated numbers immediately popped out from the rest of the field, recalls R.J. Garwood, AirEL’s senior vice president of sales and a full-time police officer and helicopter pilot in Orange County. But instead of putting the new numbers on its ARFF vehicles, the airport applied them to airfield operation vehicles. “The airfield is not that large; everything is one-half to three-quarters of a mile from the tower. The ARFF vehicles are large, bright and have lots of flashing lights, so they don’t need the additional illumination,” Rountree explains. In 2015, the airport began replacing its fleet of older Ops vehicles with five Ford Explorers equipped with the “Police Interceptor Package,” which includes light bars and high-performance engines. It also added distinctive wrap, logos and illuminated numbers to the side of each car. The new vehicles are also equipped with Whelen “Liberty” LED light bars, Rountree adds. The light bars have flashing amber lights and bright white forward-facing spotlights to better illuminate runways and taxiways during daily nighttime and early morning airfield inspections. SNA decided not to add the illuminated numbers to its police cars, since these vehicles seldom go onto the movement areas of the airfield. The Maintenance Department also decided it did not need the AirEL product, since its vehicles enter the airfield only at night when the runways are closed. The maintenance fleet includes 15 to 20 pieces of equipment, but only three regularly go onto the airfield. When John Wayne Airport (SNA) added illuminated identification numbers to all of its Operations vehicles, it may have started a trend. Long Beach Airport (LGB), in Los Angeles County, now uses the same product, and four other U.S. airports are currently testing it for potential use on their airfields. AirEL, which developed and patented the use of electroluminescent technology to illuminate markings, has sold about 500 sets in the last three years. The company tested its illuminated signage at the FAA test facility in Atlantic City. R.J. Garwood, the company’s senior vice president of sales, reports that the agency is incorporating AirEL’s specifications into suggested revisions as it revamps advisory guidelines on airport signage. “It is one more layer of safety. We are all responsible to know where vehicles are on the airfield,” says Garwood, noting that there are no similar products on the market. Officials at LGB opted to place the illuminated numbers on the rooftops of airport security vehicles. The airport security division is part of the Long Beach city police force, which also uses the illuminated numbers on cars used by supervisors and gang units. Dallas-Fort Worth International Airport (DFW) is testing the illuminated signage on top of airport police vehicles and the sides of airport operation trucks. Reno-Tahoe International Airport (RNO) and Minneapolis-St. Paul International Airport (MSP) are testing the illuminated signs on snow removal equipment.